B-Kyu: China Tour ~ Hangzhou Part 1 - What Lake? Around 200kms (or an hour on the superfast choo-choo) from Shanghai is Hangzhou, featuring a huge bloody big lake that we can't find. The population of Hangzho is a mere 7.8 million, compared to the 17 or so million in Shanghai. It feels like a country town by comparison. The star attraction is the West Lake, which is impressive once we find the thing. But we love the city itself, it feels a million miles from Shanghai. The Lonely Planet says we should stay by the lake but screw you Tony Wheeler, we're staying up in the ye olde part of town where hoardes of local tourists and Shanghai weekenders wander around to buy snacks and souvenirs. In fact we spend the whole day wandering around and we can't even find the lake, it's a huge bloody great thing too. Instead we eat. We stop at the first random place we can find to eat, even if the mascot is a rat in a chef's hat. Shawn is grumpy hungry, or hungry grumpy. This joint has a canteen vibe, buy a ticket and take it to the lady, scratch your head for five minutes trying to figure out what's going on. Pick your bowl of seasoning from the pile and put it on a tray. The nice lady will then fill your bowls up with soup and wontons. Voila! A plain, simple stomach filler for around a big $1. In 1970's Australia this was called 'short soup'. Nearby is block of pleasant tree-lined streets lined with restaurants and touristy hawker stalls. Tofu bbq'd in a slick of oil and topped with soy and green coriander, then cut into cubes. Better than a bucket of chips. That's the second biggest mushroom we've ever seen. We find ducks hanging up to dry, sadly we couldn't find somewhere to try the finished product. There's even pork hanging in the street. Anywhere I hang my pork, that's my home. We find a wonderful old quarter of town while walking away from the lake, which we still can't find. We make a round trip back along to the tourist strip and there's interesting snackages galore. Purdy pink rice cake filled with red bean paste, like a Chinese jam donut. It was a bit plain though. Steamed egg with tiny little decorations of peas, corn and Chinese sausage. The steamed egg was eggy. Another strip of hawker stands set up for tourists. The stalls were staffed by bored teenagers on minimum wage, rather than that master who has been proudly making the same dish for forty years. The food was ok but not great. Tourist food is tourist food same as anywhere in the world: average. Cumin lamb kebabs, oily but fun. This exotic looking drink is just like your Aussie can of Two Fruits. Secret Santa. Don't let the kids see he's here yet. Lovely bronze in the city centre of a street hawker. We expected Chinese cities to be all concrete and no soul, but all the city centres we visited were surprisingly pleasant, with trees and wide footpaths, wonderful for our urban hiking obsession. We've walked a few kilometres around the city but still can't find the huge lake. This is as close as we got. Fail. Still, it's purdy. For dinner we scope out the block of restaurants and market stalls near our hostel. These restaurants have 'Al & Shawn' written all over them, but right now we want somewhere to kick back with a beer. This joint looks perfect - it's called Zhouji Paidang - a busy Chinese stir fry joint - complete with beer. We liked this joint so much we came back twice. The second night we had to line up for a table. The staff were so busy but found the time and patience to deal with a couple of stupid grinning foreigners. How could we not be happy with a longneck each of Cheerday Beer? The label on the rear of the bottle states: "the water in Qiandoa Lake is green and clear with a visibility of 4 metres, it is a first-class water by national standard and can be drunk directly without being cleaned." Move over Boags. Pigs ear sliced with coriander leaves, sesame oil and chili oil. Yum. Probably $1-$2. Fish served with chili and soy beans. Around $7. Fried crispy rice rolls filled with taro paste and topped with sweet and sour sauce. It's main course and dessert all in one, strangely moreish. The trip motto "I have no idea what that was but it was delicious" certainly applies to this dish. Stir fried strips of green mystery veggies, with jelly fish (we think), amazing bean sprouts with crunchy ends and capsicum. The mystery veg was amazing, thick with a nice chew and most interesting texture. Harbin draft beer - at 3.1% it's the XXXX Gold of China. Another "I have no idea what that was but it was delicious". Some kind of crunchy veggie stir fried with chili, sesame and garlic. In the menu the it was pictured as carved in a flower shape. A simple but superb dish of Chinese greens and mushrooms. All the vegetable dishes here were only around $1 and were incredible. On our next trip we're going to go nuts on veggies. More beer, more beer, more beer. Only 2.5% dangnabbit. Prawns in a sweet soy sauce, around $7. They're hairy buggers but there's prawnies under there. Stir fried eggplant. Eggplant is always delicious. Sweet and sour fish - (we think it's the local West Lake carp) - in a lovely gooey sweet'n'sour sauce. About $7. In the lower right hand corner you can see the dish we ordered that was supposed to be a rosette. We take a big walk after dinner but still can't find that lake, maybe tomorrow. 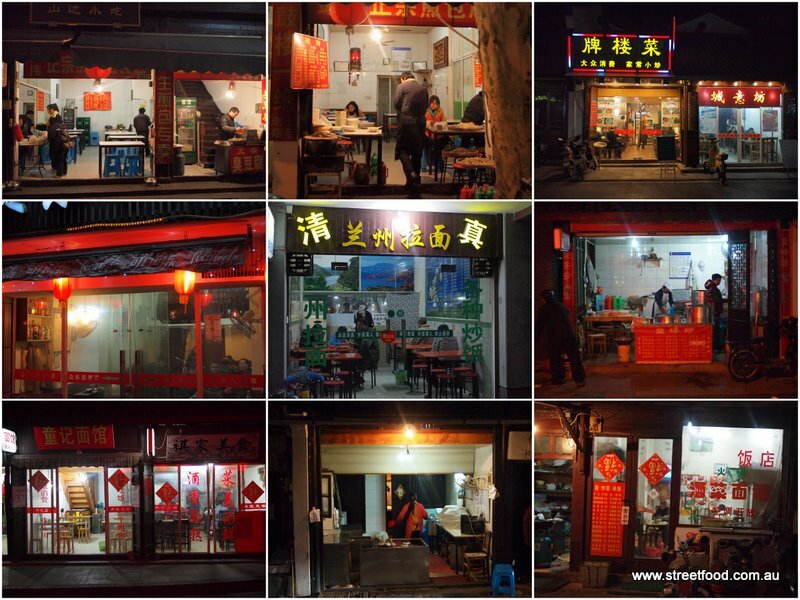 We find another street of more upmarket/mid-range sort of restaurants for the domestic tourists that looked excellent. Love the sight of the ducks just hanging around with the washing! Interesting observation about the insects only being found in tourist areas too. Holy crap that tofu looks like heaven. All I've seen of Hangzhou is the road between its airport and city limits. Drifted through it going to and coming from Yiwu. You've gotta love Chinese cities! Love the ducks with the laundry, made me lol! Shame the menus are a bit blurred, otherwise would have tried to work out the mystery veggies for you since the menu is all in chinese. I think the mystery green veg and jelly fish dish is the 3rd menu pic from the bottom - it looks like it reads: cruncy 3 veg in sauce.. can't make it out properlyas the camera's fllash is right on the words. Oh my god the short soup brings back childhood memories! My grandma used to take me to preschool and have that wonton soup for breakfast, there was an old lady sitting outside who you'd buy a ticket from and you go inside and put the ticket on a counter in the kitchen and wait a table for them to bring out a bowl of this amazingly good stuff. So good. Also I *think* the mystery vegetable is choko or some kind of Chinese melon, I only know the chinese word for it but the dish is lightly stir fried with soy sauce and sesame oil? John - that tofu was superb on a cold day, oily and salty and spicy. We too drifted past so many towns we would have loved to stop in, just not enough time to see everything. Anonymous - just booked a week long trip to Kuala Lumpur - look out for some Malaysian posts later in the year. Lucy L - thanks for your translating attempts. Wish you were with us when we were ordering! Lola - you might be right about the choko, it had that same sort of texture. Wish I had your granny. The ducks hanging with the laundry were everywhere, with fish and sausages and pork sides too. It was quite dry and cold weather, perfect for air drying. Insects are for the birds. 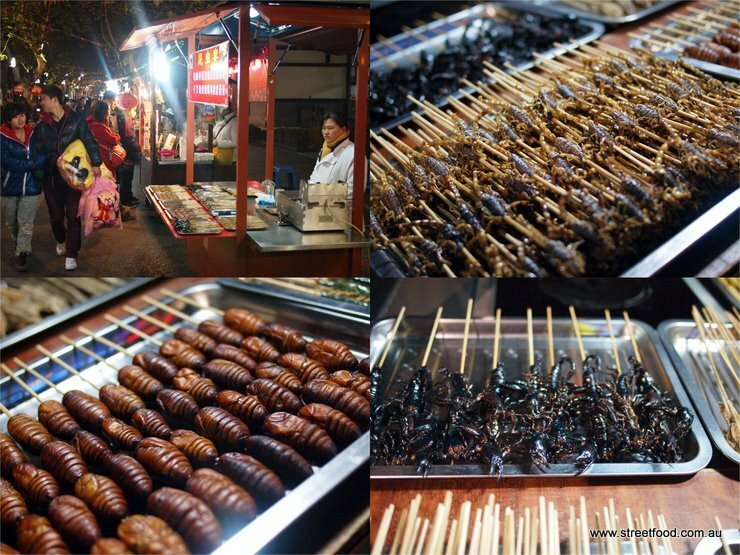 One day we'll try some, we quite enjoyed bamboo bugs in Vietnam, kinda like little witchetty grubs. lol So much fun to read your journal! I am from Hangzhou and studying abroad in U.S. I'm kinda homesick now. Actually the restaurant "Zhouji Paidang" you went is just near my home. I would eat there nearly everyday if it was near my home. Glad you liked the post, we really loved Hangzhou. Hey！ I saw your blog link from Weibo.com which is like twitter in China. Your journals have been translated into Chinese and very popular now. The veg in the first "I have no idea what that was but it was delicious" is asparagus lettuce. And the second veg you have no idea is pickle radish. Thanks so much! We have some good Chinese food in Sydney but we just don't get those wonderful vegetable dishes you have in China, so tasty and such good value. Because here in oz the Chinese vegies are sooooo expensive. I like your saying that 'anywehre i hang my pork that's my home' hahahaha it's so funny. I'll read your eating journey in other countries as well. Zhouji paidang is very famous in China. I think there is one or two of them in Guangzhou as well. *Got to try that tofu when I go back to Hangzhou! and, yes~ that bakery is very good, most famous for its roast chicken! It's jellyfish. That's my favorite!I always love dishes with jellyfish. Hangzhou is one of the favorite cities to me.Also, wonton is so wonderful for breakfast.There are so many type of wonton in china.I can just eat wontons for a week!